We begin our Lenten journey at the decisive moment of the flood, when God establishes his first Covenant with man, in the person of Noah. Noah was saved from the waters, while we (as Saint Peter points out) are saved by the waters of Baptism. This is the Covenant we live in, thanks to Christ, who came to establish this “new and eternal Covenant in his blood”. He is the only one who can do this, because he is without sin, despite “having been tempted in ever way that we are”. The Second Reading on these Sundays of Lent always acts as a bridge between the Old Testament reading and the Gospel. Here Peter links Noah with Christ: there are two types of water: the waters of the flood, which saved the few who believed, and the waters of baptism, which saved us. This is a very difficult reading! It is very “theological”, and the sentences are long and complicated. You must practice this out loud beforehand; otherwise it will come over as nonsense. 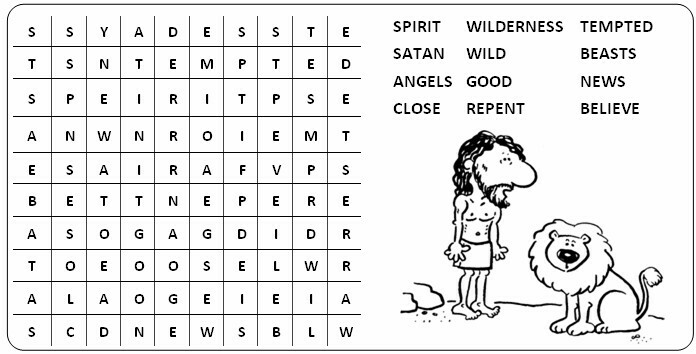 For each sentence, try to find the main clause, and separate it out from the surrounding bits: so the main clause of the first sentence is: “Christ... died for sins,... to lead us to God.” Then it leads to the “spirits in prison” (= those who lived before Good Friday), and their refusing to believe at the time of Noah. Then the final sentence: the word “type” is a technical word, meaning a “foreshadowing”: it is not a physical washing, but a pledge, through Jesus’ resurrection. "Jesus was tempted by Satan, and the angels looked after him."